Some people think Fall begins when Starbucks introduces its seasonal lattes, but we’re here to tell you that the official sign of the season can be found in nature, with red, ripe apples hanging low and heavy on tired branches. Celebrate the changing of the leaves with a day trip to one of these beloved, u-pick apple orchards. 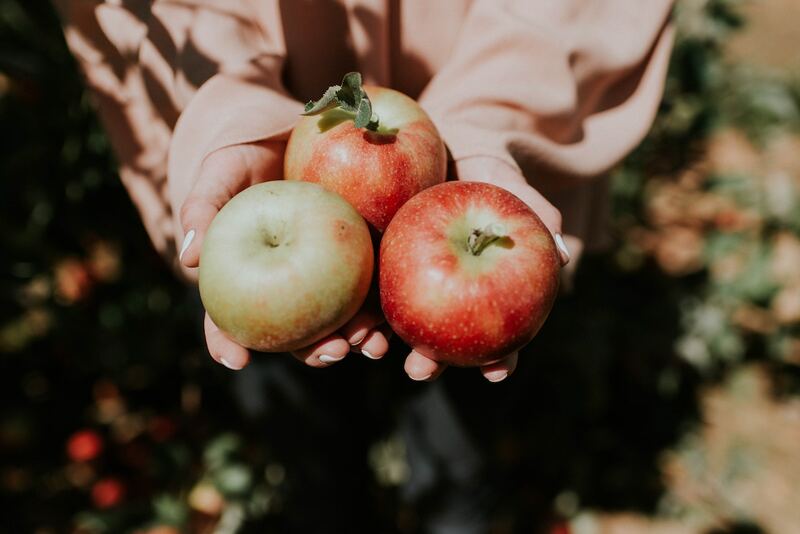 Planted peacefully on the banks of the Snohomish River for over 100 years, Swans Trail Farms has gorgeous mountain views, a 45-acre pumpkin patch, and, of course, rows upon rows of apples ripe for the picking. If you’re not too tuckered out after all your apple picking and eating, check out the farm’s petting zoo, or its tricky corn maze. Swans Trail Farms: 7301 Rivershore Rd, Snohomish; 425-334-4124. Also in Snohomish, Skipley Farm boasts over 280 types of apples, a dozen different kinds of seedless grapes, blueberries, cherries and even black currants. Schedule a tour or a horticulture class with Gil Schieber, the farm’s chief horticulturalist. His knowledge of, and passion for agriculture is evident in the farm’s meticulous layout and landscaping. Skipley Farm: 7228 Skipley Rd, Snohomish, WA; 206-679-6576. Lattin’s Cider has won several national awards, including first place at the North American Farmer’s Direct Marketing Association. Stop by for a wide variety of apples, peaches, berries, plums and pears. If you prefer your fruit with sides of sugar and butter, you’re going to have to try the famous apple fritters—melt-in-your-mouth and perfectly tart, these fritters will likely be the highlight of your visit. Lattin’s Country Cider Mill & Farm: 9402 Rich Rd SE, Olympia, WA; 360-491-7328. About an hour-and-a-half north of Seattle, BelleWood Acres is one of locals’ favorite places to drive for fall apple picking. Located in picturesque Western Washington, this estate is a 25,000 tree orchard with family tours and lessons for children on how to pick. There’s a cider press onsite for immediate, sweet deliciousness, and a cafe. Also just under two hours north of Seattle, Apple Creek Orchard hosts daily apple-picking experiences for $15 per 5-pound-gallon bucket filled. The farm is well equipped to host traveling apple pickers with its own buckets, carts and take-away boxes on hand. Guests are also allowed to eat as many apples as they want while they’re out picking. Explore the Emerald City with our insider’s guide online. Find our recommendations for the best Seattle experiences on the Pan Pacific blog! Pan Pacific Seattle welcomes visitors to enjoy luxurious amenities, unparalleled service and a prime location in the heart of the West Coast’s Emerald City, minutes from iconic sites like Pike Place Market, the Space Needle and the postcard-worthy waterfront. With a distinct Pacific Northwest sensibility elevated by Forbes Four- Star service, this Seattle luxury hotel aims to introduce travelers to the exquisite, sophisticated side of Seattle.